As for myself, my course is clear. A British subject I was born — a British subject I will die. 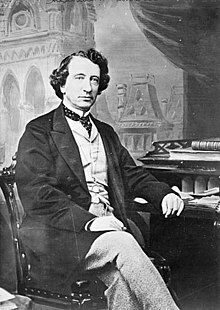 Sir John A. Macdonald (11 January 1815 – 6 June 1891) was the first Prime Minister of Canada. Macdonald served 19 years as Canadian Prime Minister, second to only William Lyon Mackenzie King. He hoped that Britain and Canada would have "a healthy and cordial alliance. Instead of looking upon us as a merely dependent colony, England will have in us a friendly nation, a subordinate but still a powerful people to stand by her in North America in peace or in war." I must have another $10,000. Will be the last time of calling. Do not fail me. Answer today. Telegram to Hugh Allan, head of the Canadian Pacific Railway, six days before the 1872 election. The release of this telegram spurred the Pacific Scandal. "He has no British instincts or British feelings or aspirations." speaking about the Chinese, debating the 1885 Electoral Franchise Act in the House of Commons, Official Report of the Debates of the House of Commons of the Dominion of Canada (Ottawa: Maclean, Roger & co, 1885) (Henceforth, Commons Debates), 18, May 4, 1885, 1582.
the Aryan races will not wholesomely amalgamate with the Africans or the Asiatics .. the cross of those races, like the cross of the dog and the fox, is not successful; it cannot be, and never will be. February 3, 1891 as the 1891 election was called, fought largely over the issue of free trade with the United States; reported at Historic Canada. Yes, but the people would prefer John A. drunk to George Brown sober. Responding to a heckler. (from John A: The Man Who Made Us by Richard J. Gwyn).